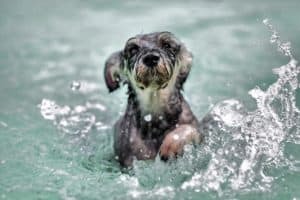 You may understand why your dog suffers from a fear of water, but through patience, plenty of praise and encouragement, and developing a strong bond of trust you will be able to help your dog overcome this fear. Stand at the side of the pool with your dog. Take his favorite ball or Frisbee and show it to him, saying excitedly “Want the ball? Want the ball?” Then say, “Get it!” Throw the ball into the pool. He should jump in to get it. Have a helper in the middle of the pool, calling the dog. Stand on the side with the ball and the dog. Throw the ball and say “Get it!” toward the helper at the same time as he’s calling the dog and splashing the water encouragingly. 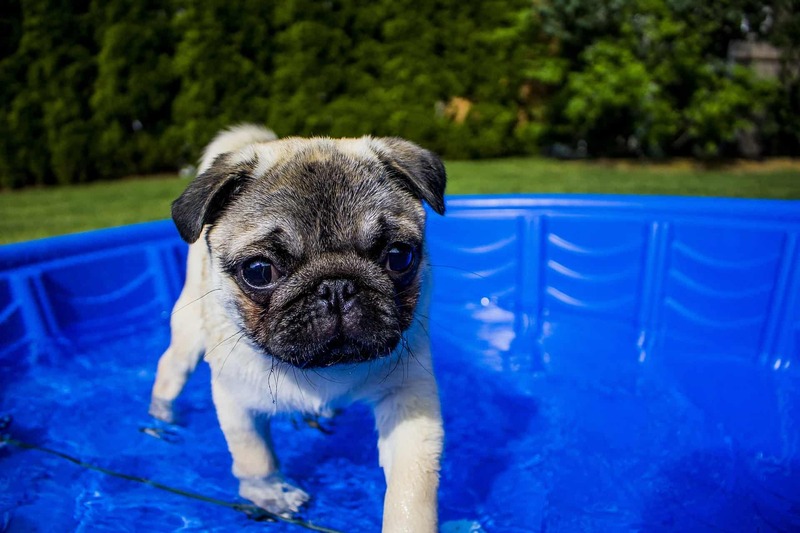 Leash your dog and run crazily around the pool deck with the dog. Run into the pool by the steps with the dog following you on the leash. Get back out, run around some more. Then run directly in off the side, hopefully with your dog following you right in. Put a leash on your dog, getting in at the side. Start swimming away, saying “Let’s go, Let’s go!” as the leash gets tighter. Tug gently, until your dog jumps in. 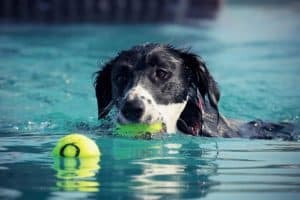 Whichever method works, continue practicing repeatedly until the dog is confident. 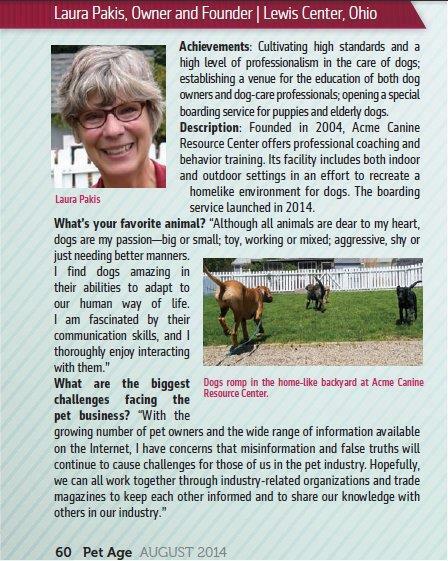 This entry was posted in Dog Behavioral Issues and tagged teaching your dog to like water, water phobia in dogs. Bookmark the permalink.